Notes: This is the day that the veil between the world of the living and the world of the dead is at its thinnest. This is a good time for divination. At dinner, remember to set a place for your loved ones that have past this year. Leave an offering of food and drink on your door step for those souls that may still wander. SAMHAIN, (say Sow-een) or Halloween, the final harvest, is indeed our most holy and sacred Sabbat. The commencing of the season of darkness, it is the festival of Death, and as so it is the celebration of the of the Eternal Cycle for without death there can be no rebirth. This is the time that the new cycle truly begins. The spirit of the God has descended into the Underworld and the Sun Child is growing within the Goddess, waiting in the depths of the Earth to be reborn at Yule. It is the time when the Goddess is in Her aspect as Crone. She is Destroyer and Healer, Wise Woman and Midwife of Transformation. Her cauldron is the great womb in which all things are conceived, grow, and are born. Samhain is the time of introspection, it is the time to assess and re-tune ourselves to the beliefs in the oneness of all spirits, and in our firm resolution that physical death is not the final act of existence. The veil between the worlds is at its thinnest and the consciousness which separates the land of the living from the land of the dead. We remember and honor our loved ones and ancestors; we release the spirits of those we have lost. We mourn but we rejoice. We laugh, feast, tell stories, sing…for this is the triumph of Life! Symbols include the lighting and ritual extinguishing of candles, the cauldron, the web, black candles, the practice of all forms of divination. Sly does it. Tiptoe catspaws. Slide and creep. But why? What for? How? Who? When! Where did it all begin? “You don’t know, do you?” asks Carapace Clavicle Moundshroud climbing out of the pile of leaves under the Halloween Tree. Samhain. All Hallows. All Hallow’s Eve. Hallow E’en. Halloween. The most magical night of the year. Exactly opposite Beltane on the wheel of the year, Halloween is Beltane’s dark twin. A night of glowing jack-o’-lanterns, bobbing for apples, tricks or treats, and dressing in costume. A night of ghost stories and séances, tarot card readings and scrying with mirrors. A night of power, when the veil that separates our world from the Otherworld is at its thinnest. A “spirit night”, as they say in Wales. All Hallow’s Eve is the eve of All Hallow’s Day (November 1). And for once, even popular tradition remembers that the eve is more important than the day itself, the traditional celebration focusing on October 31, beginning at sundown. And this seems only fitting for the great Celtic New Year’s festival. Not that the holiday was Celtic only. In fact, it is startling how many ancient and unconnected cultures (the Egyptians and pre-Spanish Mexicans, for example) celebrated this as a festival of the dead. But the majority of our modern traditions can be traced to the British Isles. The Celts called it Samhain, which means “summer’s end”, according to their ancient twofold division of the year, when summer ran from Beltane to Samhain and winter ran from Samhain to Beltane. (Some modern covens echo this structure by letting the high priest “rule” the coven beginning on Samhain, with rulership returned to the high priestess at Beltane.) According to the later fourfold division of the year, Samhain is seen as “autumn’s end” and the beginning of winter. 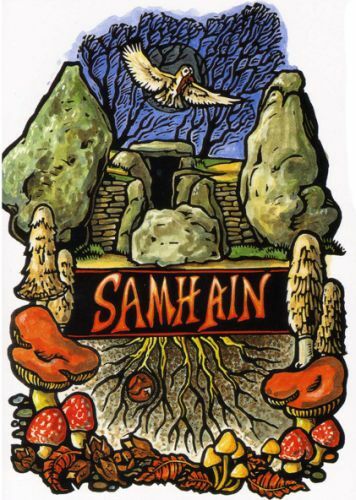 Samhain is pronounced (depending on where you’re from) as “sow-in” (in Ireland), or “sow-een” (in Wales), or “sav-en” (in Scotland), or (inevitably) “sam-hane” (in the U.S., where we don’t speak Gaelic). Not only is Samhain the end of autumn; it is also, more importantly, the end of the old year and the beginning of the new. Celtic New Year’s Eve, when the new year begins with the onset of the dark phase of the year, just as the new day begins at sundown. There are many representations of Celtic Gods with two faces, and it surely must have been one of them who held sway over Samhain. Like his Roman counterpart Janus, he would straddle the threshold, one face turned toward the past, in commemoration of those who died during the last year, and one face gazing hopefully toward the future, mystic eyes attempting to pierce the veil and divine what the coming year holds. These two themes, celebrating the dead and divining the future, are inexorably intertwined in Samhain, as they are likely to be in any New Year’s celebration. As a feast of the dead, this was the one night when the dead could, if they wished, return to the land of the living, to celebrate with their family, tribe, or clan. And so the great burial mounds of Ireland (sidhe mounds) were opened up, with lighted torches lining the walls, so the dead could find their way. Extra places were set at the table and food set out for any who had died that year. And there are many stories that tell of Irish heroes making raids on the Underworld while the gates of faery stood open, though all must return to their appointed places by cockcrow. As a feast of divination, this was the night par excellence for peering into the future. The reason for this has to do with the Celtic view of time. In a culture that uses a linear concept of time, like our modern one, New Year’s Eve is simply a milestone on a very long road that stretches in a straight line from birth to death. Thus, the New Year’s festival is a part of time. The ancient Celtic view of time, however, is cyclical. And in this framework, New Year’s Eve represents a point outside of time, when the natural order of the universe dissolves back into primordial chaos, preparatory to reestablishing itself in a new order. Thus, Samhain is a night that exists outside of time and, hence, it may be used to view any other point in time. At no other holiday is a tarot card reading, crystal reading, or tealeaf reading so likely to succeed. The Christian religion, with its emphasis on the “historical” Christ and his act of Redemption 2000 years ago, is forced into a linear view of time, where seeing the future is an illogical proposition. In fact, from the Christian perspective, any attempt to do so is seen as inherently evil. This did not keep the medieval church from co-opting Samhain’s other motif, commemoration of the dead. To the church, however, it could never be a feast for all the dead, but only the blessed dead, all those hallowed (made holy) by obedience to God—thus, All Hallow’s, or Hallowmas, later All Saints and All Souls. There are so many types of divination that are traditional to Hallowstide, it is possible to mention only a few. Girls were told to place hazelnuts along the front of the firegrate, each one to symbolize one of her suitors. She could then divine her future husband by chanting, “If you love me, pop and fly; if you hate me, burn and die.” Several methods used the apple, that most popular of Halloween fruits. You should slice an apple through the equator (to reveal the five-pointed star within) and then eat it by candlelight before a mirror. Your future spouse will then appear over your shoulder. Or, peel an apple, making sure the peeling comes off in one long strand, reciting, “I pare this apple round and round again; / My sweetheart’s name to flourish on the plain: / I fling the unbroken paring o’er my head, / My sweetheart’s letter on the ground to read.” Or, you might set a snail to crawl through the ashes of your hearth. The considerate little creature will then spell out the initial letter as it moves. Perhaps the most famous icon of the holiday is the jack-o’-lantern. Various authorities attribute it to either Scottish or Irish origin. However, it seems clear that it was used as a lantern by people who traveled the road this night, the scary face to frighten away spirits or faeries who might otherwise lead one astray. Set on porches and in windows, they cast the same spell of protection over the household. (The American pumpkin seems to have forever superseded the European gourd as the jack-o’-lantern of choice.) Bobbing for apples may well represent the remnants of a Pagan “baptism” rite called a seining, according to some writers. The water-filled tub is a latter-day Cauldron of Regeneration, into which the novice’s head is immersed. The fact that the participant in this folk game was usually blindfolded with hands tied behind the back also puts one in mind of a traditional Craft initiation ceremony. With such an important holiday, Witches often hold two distinct celebrations. First, a large Halloween party for non-Craft friends, often held on the previous weekend. And second, a coven ritual held on Halloween night itself, late enough so as not to be interrupted by trick-or-treaters. If the rituals are performed properly, there is often the feeling of invisible friends taking part in the rites. Another date that may be utilized in planning celebrations is the actual cross-quarter day, or Old Halloween, or Halloween O.S. (Old Style). This occurs when the sun has reached fifteen degrees Scorpio, an astrological “power point” symbolized by the Eagle. The celebration would begin at sunset. Interestingly, this date (Old Halloween) was also appropriated by the church as the holiday of Martinmas. Of all the Witchcraft holidays, Halloween is the only one that still boasts anything near to popular celebration. Even though it is typically relegated to children (and the young-atheart) and observed as an evening affair only, many of its traditions are firmly rooted in Paganism. Incidentally, some schools have recently attempted to abolish Halloween parties on the grounds that it violates the separation of state and religion. Speaking as a Pagan, I would be saddened by the success of this move, but as a supporter of the concept of religion-free public education, I fear I must concede the point. Nonetheless, it seems only right that there should be one night of the year when our minds are turned toward thoughts of the supernatural. A night when both Pagans and non-Pagans may ponder the mysteries of the Otherworld and its inhabitants. And if you are one of them, may all your jack-o’-lanterns burn bright on this All Hallow’s Eve.